Bismarck, N.D. (AP) — North Dakota officials appear poised to go after the U.S. government — and thus U.S. taxpayers — to recoup more than $38 million in state expenses related to months of protests against the Dakota Access pipeline, though a longstanding offer from the project’s developer to pay up is still on the table. One taxpayer watchdog group questions why the state isn’t jumping at the offer from Dallas-based Energy Transfer Partners, a company worth billions of dollars. “You take the money when you can get it,” said Dustin Gawrylow, managing director of the North Dakota Watchdog Network, which keeps tabs on how public money is spent. The matter might not be that simple. Common Cause, a nonpartisan group that promotes government accountability, says accepting money from a private-sector business in an industry it regulates would present the state with an ethical dilemma. Pipeline opponents have long accused the state of being too cozy with ETP, and if the state takes the company’s money “it certainly would lend credence to those arguments,” said Joye Braun, a protest leader. “For Energy Transfer to offer a donation, basically that’s paying off the state for using state resources as personal security,” she said. Gawrylow said ETP’s offer, while it would help the state, might be more marketing than generosity. “They’re not spending it out of the goodness of their heart. They’re spending it to build goodwill in North Dakota” after months of upheaval, he said. Work is wrapping up on the $3.8 billion pipeline to move North Dakota oil 1,200 miles to a shipping point in Illinois, and oil could be flowing as early as Monday despite an ongoing legal challenge by Sioux tribes who fear the project could affect their water supply — a claim ETP rejects. The saga has endured for months, with hundreds and sometimes thousands of pipeline opponents camping on federal land near the drill site and often clashing with police. 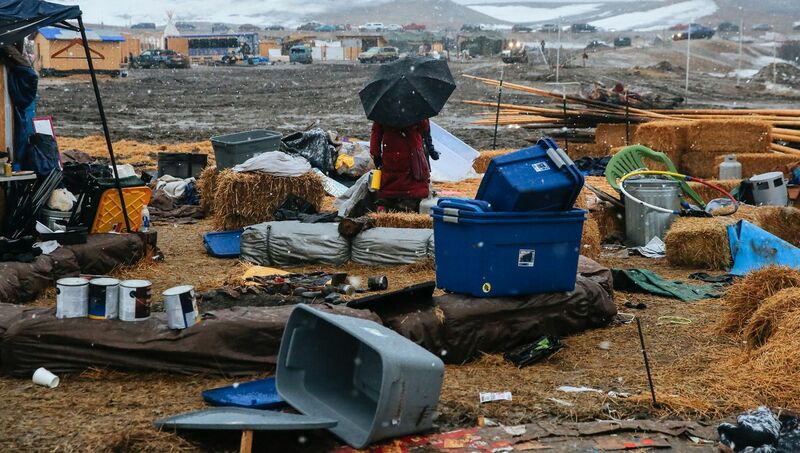 About 750 arrests were made between early August and late February, when camps on property managed by the Corps were shut down in advance of spring flooding season. State officials have not been clear on why they haven’t accepted ETP’s offer, first made in the fall. “The governor hasn’t said whether the state will or won’t seek reimbursement from ETP, only that all options are on the table,” Mike Nowatzki, spokesman for Republican Gov. Doug Burgum, said. State Budget Director Pam Sharp told The Associated Press that nothing in state law would prevent North Dakota from accepting such a donation, and that it’s happened before, though not in such a sizable amount. For example, smaller private donations have been made to the state-operated North Dakota Veterans Home, she said. U.S. Sen. John Hoeven, a Republican from North Dakota, said his office also is working to get the Corps to reimburse protest-related state costs. State Attorney General Wayne Stenehjem has publicly broached the idea of suing the federal government. He didn’t respond to requests for comment. The state Emergency Commission late last year approved borrowing $17 million to cover the costs, and the first bill Burgum signed as governor after taking office in January authorized an additional $8 million. But the cost has surpassed the approved total by $13 million, and officials plan to ask the Legislature for more money, state Emergency Services spokeswoman Cecily Fong said. “I would be very surprised if the Legislature does not cover the full cost,” said Republican state Rep. Jeff Delzer, chairman of the House Appropriations Committee. Accepting money from ETP would be a risky way of doing that, according to Paul S. Ryan, vice president of litigation and public policy for Common Cause. “One would reasonably question whether the state could in an unbiased way regulate ETP if it is receiving tens of millions of dollars in cold hard cash from ETP,” he said.